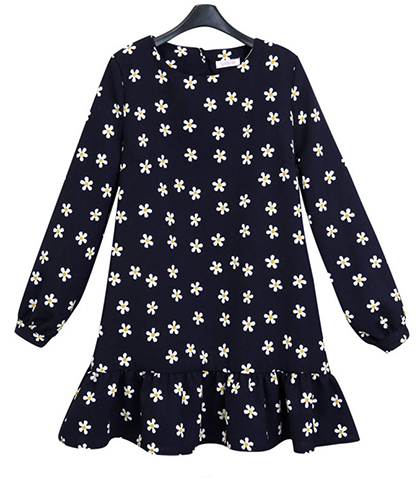 This cute dropped waist mini dress is one that you will want to wear virtually everywhere. The dress is ultra mini length with the hemline ending just beneath the hips. A wide, lively ruffle appears around the hemline. The dress has a rounded neckline and long, loosely fitted sleeves. The sleeves have cuffs on the ends. This dress is presented in a whimsical black and white snowflake print. It zips up the back with a long concealed zipper. This dress is fully machine washable. We recommend washing it in warm water and tumbling it dry on a low heat setting. The dress is available for purchase in sizes Small, Medium, Large and Extra Large.